When the storm and problems of life seem overwhelming, where can you turn for hope and encouragement? Have you heard any good news recently? All you could hear is bad and heart-breaking news. You are probably getting the same daily dose of human nature with the steady traffic troubles of some headlines concerning horrific slaughter of people here and there, conflict everywhere, crime waves suffocating our urban centre, and the anguish of a stalled economy. The list is endless. The throw into the mix is our personal and family challenges and the combination of all of these can paralyze even the faith of the faithful. But in spite of all these, be rest assured that God understands the plights of His people more than you think. He is fully aware of that your anxiety, hunger, poverty, sickness, joblessness, barrenness and even that hopeless condition, and He will provide you with all you need to rise above these storms of life. In this message, Fr. 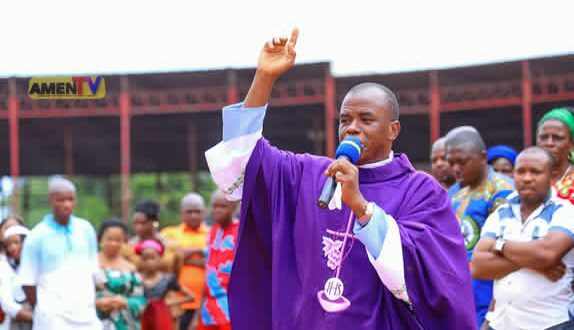 Mbaka admonishes the people of God not to trouble their hearts over the vicissitude of life, rather to choose to trust and have full confidence in God who is their present helper in times of troubles. On the eve of the last super, before His difficult journey to the cross, Christ offers comfort and wonderful consoling words to His disciples, for He knew what lay ahead. He knew the trials they would soon face. He could have said so many things at that moment, but these are the words He chose then, and these words had a powerful effect on His disciples and even on us till today. Jesus told them, ‘’Let your hearts not be troubled; trust in God, trust also in me’’. (John 14;1). One of the most dreaded diseases in the world today is what we call ’heart attack’. Every day we hear of someone cut down by a heart attack. Jesus is not talking about physical heart trouble but is talking about a spiritual heart illness. He is talking about a troubled heart, a burdened, distressed, worried, disturbed and a sorrowful heart. This kind of heart trouble is common and no money can keep it away, the only cure is Jesus. It is beautiful that Jesus anticipates what we will face in this life, as His believers will likely be troubling. Each and every one of us can name a lot of things that are weighing on our hearts these days. Small things affect us and the choice we make. These troubling challenges can disturb every aspect of our lives. Often, these troubling feelings challenge our faith as well, and can make it difficult for us to have faith in God. But over and over in His word, Jesus reminds us not to worry, not to fear, not to be troubled in our hearts, to trust in Him. That same night before Jesus died, He left His disciples with a gift—peace of mind and heart. ’’Peace I leave with you, my peace I give to you…let your heart not be troubled, neither let it be afraid’’ (John14;27). This peace was not just for His disciples, but also for us today. The moment you put your trust in Jesus Christ, He who is the prince of peace comes to live inside you, and you will be able to receive every blessing that you will ever need pertaining to your soundness and wholeness in order to enjoy a peaceful life. The peace that Christ mentioned is something He own by experience and shares with those who respond to His call. Such peace is direct gift from God to those who focus on and truly believe in His promises and reach for them even in their very real moment of despair. But people may ask; if this is true, then why do I still see problems in my health, finances, family and relationships? The answer is: ‘a troubled heart’. That is why after Jesus said,’’ peace I leave with you’’, He equally said,’’ Let not your heart be troubled, neither let it be afraid’’. God’s ever- present supply of blessings towards you is like the water flowing freely from the tap. But you don’t see the blessings when you allow your heart to be gripped by worry or fear. Many at times you will experience troubled- heart, but Jesus reminds you not to let your hearts be troubled. Take care of your heart, for it is the fountain and seat of all thoughts, passion and purpose in your lives. Guard your heart from being troubled to be able to guide every other thing. When fearful and anxious thoughts tries to overtake you, remind yourself of Jesus words. ‘’let your heart not be troubled neither let it be afraid’. Even when things appear to get worse, you can always confess positively, saying thus: ’lord, I refuse to worry about these things. In the midst of all these, I see the finished work of Christ. You said, ’’It is finished’’. So, my healing is accomplished; my marriage is blessed; my debts are cleared; I will not let my heart be troubled by these things’. Your family and friends cannot, ‘let not your hearts be troubled for you’. Only ‘you’ can. So guard your heart from being troubled. Believe that God can take care of your situation. You don’t have to guard your career, reputation or even health. When you guard your heart, you will be able to guard every other thing. The answer to your troubled heart is: trust in God. ‘Do not let your hearts be troubled’. So many people may be saying that this statement of Jesus actually sound easy, but quite the most difficult thing in the world. Many people may say: How can you not be troubled when facing huge trials, loss, illness, uncertainty? The only answer lies in God, and it’s how Jesus ended the verse: ’trust in God; trust also in me’ (John 14;1). This means that, when you are tempted to have a troubled hearts because of the challenges of life; trust, believe, have faith and full confidence in God, for He is the answer to your troubles. He is your help for the challenges that you face. He knows your predicaments, even the toughest one you may have just passed through, for He is with your every step. Even if your life may be riddled with obstacles, potholes and even dangerous cliffs, and you find yourself struggling just to stay on course, you can still have hope, even in the very midst of the tough situation, for you are secured in Him. God is trustworthy. He is faithful and He has much better and greater blessings still in store for you. As Christians, you need to embrace the spiritual reality that, Christ never said our lives would be trouble-free, but did say that He would provide us with the means to rise above whatever comes. God offers an incredible promises to His faithful ones in times of trouble that He is not a distant God, and it is a promise you can hold onto at those moments of trials. Is there any body here with a troubled hearts? Are you worried, troubled, agitated, distressed and frustrated? What is that thing that has been pressing on your heart? Make a choice to leave it for God to handle. Ask Him for His presence of peace to fill your life today. No matter what, do not be troubled, distressed, worried and agitated. Believe, trust and have full confidence in God. Jesus did not want to know why your heart must be troubled. It is a matter of ‘no matter what happened’; do not let your heart be troubled. Fear not, be strong, and do not be afraid. God is in control. As Jesus has told you not to let your hearts be troubled, it is a matter of choice, and where to keep your focus. You can remain paralyzed in despair or you can choose to heed to the ongoing words of Jesus’ and His calming assurance, ‘’let not your heart be troubled; believe in God, believe also in me’’. Many people are suffering from high and low blood pressure, and heart attack because of a troubled hearts. Many are troubled about worldly things like; what to eat, drink or wear. Why are you worried? Why do you want to kill yourself with worries? In Math.6;31 Jesus said that you should not worry about what you will eat, drink nor wear because your heavenly father knows that you need all these things, but rather you should seek first the kingdom of God and its righteousness, and all these things shall be added unto you. Are you troubled because you are looking for the fruits of the womb? God gave Naomi a new beauty through Obed who was the son of Boaz and Ruth, when all hope was lost. God still blessed Hannah with Samuel after so many years of barrenness. Let your hearts not be troubled O you barren women over your marriage. God can handle the situation. He can bless you with fruits of the womb, believe He can. Pregnant mothers, let your heart not be troubled over the medical doctor’s report concerning your pregnancy. If your heart was troubled before, let it be calm now. Let there be divine maximum tranquility and serenity in your heart. If you remember that there is God, you should relax yourself. God is never forced to forsake any of His children. No matter how desperate the situation may be or how great the problems you face, the heavenly father stays by your side to meet your deepest needs with his infinite wisdom and power. Under no circumstances will He give up on those He has purchased with the blood of His son. You may at times feel abandoned, but you will never be abandoned. So, let your hearts not be troubled. Is your heart troubled because you have not yet gotten married, While all your mates have all gotten married with children? Do not be troubled, God has a different program for you. You are unique, special and extra ordinary. Your own husband is on the way. He is passing through divine packaging. Let your heart not be troubled because your loved ones died like Naomi experienced. Rejoice rather because God is alive who is able to change your ugly condition. The only time you begin to worry, panic and get troubled is when you hear that God is dead. God can take care of you. He is your helper in times of troubles. Even if somebody has threatened to kill you, is that enough to make you feel distressed? . How sure are you that the person will see the next day? Even if the person has been succeeding in killing others, you are not others, you are unique. They cannot try such on you otherwise they will be messed up. Put all your trust in the lord and fear not. Believe that they cannot destroy you. If you had known who you have in the person of Jesus, you would not have been worried. Are you worried because you do not have a house? That you don’t have a house now does not mean you cannot have one tomorrow. Trust God for a house, rather than getting distressed. Worries do not provide any solution. The solution is on God. God may be up there planning for you, while you are down here worrying yourself to death. If you are passing through any battle, let your heart not be troubled. The God whom you trust is the one who can fight for you. I don’t know who or what is fighting you, but all I know is that God can handle the person. Exodus14;14 says’’ stand your ground, fear not, God will fight for you’’. Also, Deuteronomy 1; 30 said that God will fight for you. In Exodus 12, did He not fight for the Israelites when they were sleeping, and enjoying their pass over night? That faithful night when the angel of God passed over the house of Israelites, every first born of both human and animals of the Egyptians died that night. For He said in Exodus 12; 17, when I see the blood, I will pass over you. God is going to pass over again, and fight for you. When the Israelites finally left the land of Egypt and were on their way to the Promised Land, when they got to the Red Sea, Moses struck the water and it divided into two. The people of Israelites crossed on a dried land. But when the Egyptians wanted to cross, God instructed Moses to strike the Red Sea again. The water came back and swallowed the whole of the Egyptian armies. Are you troubled because you received a report medically that you are not well and you may not make it; that you may not live up to a particular date? Don’t be troubled. God is still alive, you have the healing God. Our God is Raphael, He can heal you. If you were told that you have cancer or turmoil or any diagnoses of an incurable sickness, God can heal you. Medically, it can be incurable, but with God, there is nothing like incurable diseases. Even if you were told that you are going to die, don’t be troubled. God says you will live. You shall not die; you shall live to declare the works of lord. Habakuk 1; 12 says that you shall not die. You will see your children’s’ children. God will deliver from the power of death. Is year heart troubled over the economic recession in Nigerian that has even landed you into a poverty-stricken person? It is going to be well. Have you not heard what happen in Math.17;27, how Jesus instructed Peter to go to the lake to catch a fish on which there would be a coin on His mouth? God can bless you and establish you beyond measure if only you can trust in Him. God has the solutions. Our God is El-Jireh, He can provide for you. Are you troubled because there is no food? You will not die of hunger; you will not die of thirst. He can rain manner for you as he did for the people of Israel in Exodus 16. So let your heart not be troubled. Even when you are declared a nonperformer? God can make you an excellent performer. I claim healing of troubled heart and inner hurt for you. Were you disappointed, and this has made you to be heart-broken? Joel 2;26 says,’’ my people shall no more be disappointed’’. Do not be troubled over the bad news you are hearing around the world today. This is because I have good news for you. Ezra 10; 2 says, ’’in spite of all these, there is still hope’’ Where you troubled over joblessness? God can provide you with a good job. Just believe in Him. New job, promotions and opportunities are coming. Are you troubled because you are indebted? God can redeem your debt for you .Were your possession taken from you and given to someone else? God knows what to do to restore your possessions back to you. He will give you your own share and portion. You will possess your possessions. Are you troubled because your loved one is in prison? God can set the prisoners free. Even if your name was taken to the native doctor, don’t be troubled. God will fight for you and deliver you. Even if you are rejected, abandoned and castigated, God will come to your rescue. Even when you are battling with sin, and cannot pray well, God will give you the anointing of prayer. He will communicate to you the righteousness of Jesus Christ. As you are going out and coming back, let your heart not be troubled. God will protect and guide you from the arrows of the enemies. He will give His angels charge over you to protect you in all your ways. Why are you troubled? Are you troubled over Jezebel? God can fight Jezebel for you. Are you like Elijah that was troubled over the prophets of Baal in 1kings18? God will answer you by fire, the prophets of Baal are going to be put to shame for your sake. Are you worried over any Herod? God will fight Herod for you; Are your heart in distressed over any Pharaoh? God will conquer him for you. Are you disturbed over any Goliath? He will fight Goliath for you as He did for David ( 1 Samuel 17). Instead of being troubled, praise the lord and remind Him of His promises. Do not let your heart be troubled. Instead of being troubled; begin to praise the lord, for the things He has done, so that He will do more. Give thanks to the lord with songs and praises. Sing to the lord new songs. You can only receive from God with a joyful and a thankful heart, and not a troubled heart. Your miracles are on the way. If your hearts is troubled, you may die before the miracles will manifest. When you let your heart to be trouble; your favor, blessings, good opportunities, healing will be hanging. But when you believe in God and your heart is not troubled, your miracles, healing, promotion, favor, appointment, joy, opportunities will be received in abundance. As the storms of life approach you, focus on the promises of God. When you think your situation is impossible to handle, remember Jesus’ words,’’ the thing which are impossible with men are possible with God’’ (luke18;27). When the storms of life have knocked you down, remember that God is there for you. He said; ‘’come to me all you who labor and are heavy laden, I will give you rest’’ (Math11:28). When you are feeling utterly alone, remember Jesus’ last word for His disciples before He ascended to heaven. ‘’I am with you always even to the ends of the age’’ (Math.28:20). In Ps. 46; 1’’ God is our refuge and strength, always ready to help in times of trouble’’. Ps. 91:5, says,’’ you called me and I answer you and delivered you from all your troubles’’. So don’t be troubled. Ps. 50:15 says,’’ Call on me when you are in trouble, I will rescue you, and you will give me glory’’. Anything that wants to trouble your heart, remember that you have Jesus who is the Alpha and Omega, and has told you to have faith in Him. He is the beginning and the end. He who told you not to be troubled is the One who has defeated death. Bible said, ’death cannot hold him captive’, because He is the author of life, and the One who gives you life, air and everything. In Romans 4:17, ‘’He calls into existence what does not exist and He raises even the death’’. What can He not do? He is able to handle your troubles, and that is why He told you not to let your heart be troubled. Then, When your heart has been stilled, then pray that God will guide you to someone else’s heart beat that is racing even faster, so that you can let him or her know that it is all right, that God is in the storm with us. Instead of getting troubled, remind Him of His promises. Remember the word of God which must come to pass. Use the word of God to address every situation of your life. Remember Jer.29; 11 which says that God has plans for you, to give you a future and a hope. Remember Ps.23:1 which stated that God is your shepherd, you shall not want. Ps.91; 16 says that He will satisfy you with long life and grant you His salvation. I peter 2; 9 says that you are a chosen race, a royal priesthood, a holy nation, God’s very own possession, for He called you out of darkness into His wonderful light. So why are you troubled? In Ps. 91:11-12, God has given His angels charge over you to keep you In all your ways. In 1 peter 1:19, you are purchased with nothing that is perishable, you are purchase with imperishable blood of Jesus and Ps.35; 7 says, ’He will send His angels to encamp around you’. Go and sleep. God is awake for you even in the storm of your life. Even when the storm of your life becomes so fierce, He can calm it for you. You are going to enjoy divine peace. As your mind remain fixed on Him, your heavenly father shall supply all your needs according to His riches in Christ Jesus. (Ph 4:19). I come against any ugly condition that has been troubling your heart in the name of Jesus. Let the power of God come against them. I uproot them from the tap root because they are not planted by God. Math 15 says,’’ Every tree not planted by God shall be uprooted’’. These ugly condition, be uprooted in the name of Jesus, Amen. May God the Father, Son and Holy Spirit give you His grace and peace to live above the troubles and worries of life in Jesus Name, Amen.